In the creative aspects of her work, the 31-year-old Mumbai resident has always felt more at home. After completing her studies in fine arts at the Parsons School of Design, New York, she began freelancing and taking up projects for friends. It was her father who nudged her in the more serious direction of private equity. “He pushed me to think bigger.” So Kapoor began scouting for offbeat, less-explored ideas in businesses, and set up Do It Creations to launch or support them using the family office funds. First, she started Brand Canvas, which created artworks for companies that would help convey their brand philosophy. This included graphic wall art, murals, decorative paintings, panel designs, and video installations. Then came Pressto, a high-end laundry and dry cleaning chain from Spain, which she helped bring into India some years ago. Next in line was perhaps her most ambitious idea, of founding a design school in association with her alma mater, Parsons, in 2013. It proved easier than expected as serendipitously the New York-based institution had at the time been looking to expand into South Asia. At the appointed hour for our interview, Kapoor is still busy and suggests having a look at the school while she wraps up meetings. Her team offers a whirlwind tour of the fourth, fifth, sixth and eighth floors of a commercial complex in Lower Parel, which serve as the campus for her Indian School of Design and Innovation (ISDI). Work is still in progress as new wings and laboratories are being added. Last year, Microsoft Ventures partnered with the institution for a “creative accelerator” programme, encouraging a boost in enrolments. From 30 at the outset, the number of design students has climbed close to 500, says Kapoor. The Lower Parel space also hosts a communication school, and a management school is set to be launched too. While it might have been easier to build a big campus in the suburbs, it was a conscious decision to have the school in the heart of the city, says Kapoor. She believes in educating students closer to the business ecosystem. Kapoor says she decided to step into education in the years after her return from New York because more young people here were looking at edgy, alternative careers in fields such as media, advertising or hospitality, rather than merely opting for jobs. The startup culture was burgeoning too. In the climate of those times, she decided to set up a platform for both to flourish. Students are actively encouraged to create startups for incubation. So far, the school has spawned ventures, including an aggregator for fitness centres and an ed-tech startup that tailors content based on a student’s level of proficiency. 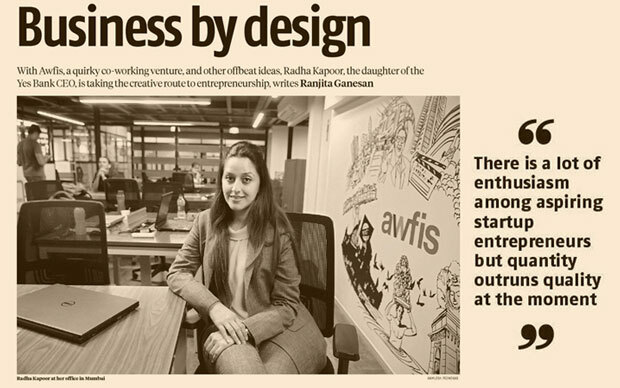 Other than her schools, the entrepreneur is most excited about Awfis, a co-working space firm that she and Amit Ramani co-founded with an investment $10 million. The startup, named with a play on the words “awesome” and “office”, spruces up underutilised spaces in buildings of prime areas and rents them to freelancers, startups and SMEs. Equipped with most trappings of modern workplaces, the spaces come with options of single desks, cabins, meeting rooms or larger offices. She describes it as “an Uber for commercial real estate.” The idea is that users can plug and play there, instead of choosing to work out of, say, a Starbucks. To help them make that switch, there is even an unlimited supply of coffee and tea. 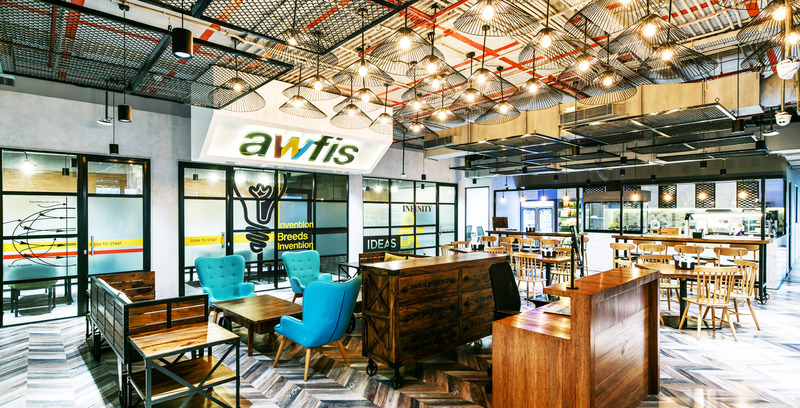 In its first year operating in Mumbai, Delhi and Bengaluru, Awfis has added 1,500 seats but plans to grow to 10,000 by the end of 2016. 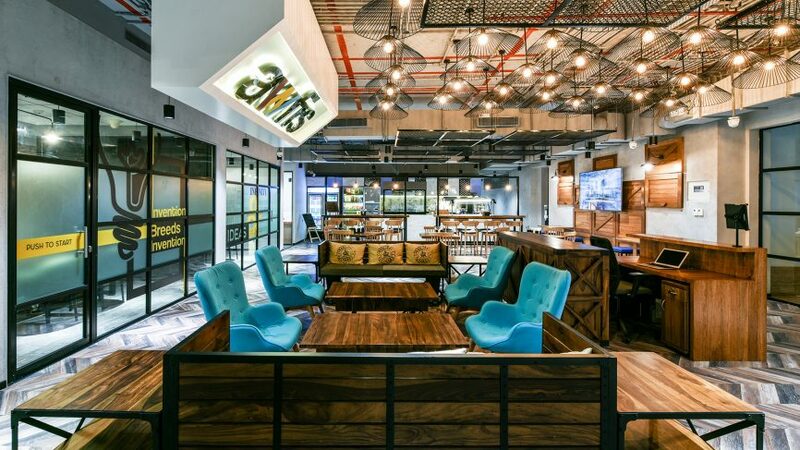 Apart from the usual mix of startups and SMEs, even corporate offices have opted to use Awfis’ centres in Delhi, says the company. Kapoor notes there is a healthy presence of women entrepreneurs and employees in the startups signing up for spaces at Awfis. Hopefully, that will only increase going forward, she adds. This set-up may be the first of its kind in India but co-working space startups have sprung up internationally. The most popular example is US-based WeWork, which offers a free keg of beer at its centres. The firm recently announced its intentions to come to India and according to some reports, is already in talks with local developers. Like WeWork, Awfis wants to create an environment where different entrepreneurs can network. It further offers to connect users with services like legal advisory, auditing, and cloud computing. “There is a lot of enthusiasm among aspiring startup entrepreneurs but quantity outruns quality at the moment,” says Kapoor. She continues to eye potential investments. Her approach is to look for gamechanging ventures that have scalability. She also evaluates ideas based on design, innovation and creativity. The number of names under Kapoor’s umbrella company is growing. As she gets busier, Kapoor’s involvement in initial ventures such as Brand Canvas and Pressto has reduced. She shares the firm’s progress with her father at dinnertime or over Sunday lunch. When the requirement for capital grows, she may look outside the family office fund to raise money. But as she talks with relish about making spaces young and energetic, and of the need for good business to have design sense, it is clear that finance will still finish second to creativity for Kapoor.